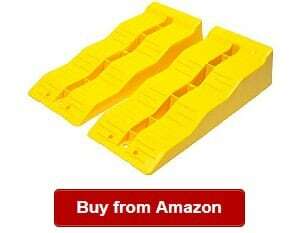 Are you looking for the best RV leveling blocks? You probably love camping out with your recreational vehicle, going from one camping site or to another. However, these places do not always have leveled parking grounds, and that’s an issue. We should not park on an uneven surface or our RV will tilt or shift to one side. When that happens, you know the next scenario – our appliances will tilt, and they might be damaged in the process. So, we need these levelers. However, it is not as easy as adding any product to cart. We must consider our options carefully to pick the right one that will last and work well for our rig. For this reason, we’ve put up this guide and highlighted the 12 best products in the category so that you can later choose. Also, we’ve discussed about certain things to factor in when weighing your options. If you’re ready, let’s begin. So when we’ve found the perfect spot on the campsite to park our rig, but there is one problem – the surface is not leveled. What are we going to do? Should we give us the space just so the ground is uneven and settle for a les ideal place? We don’t have to worry about that when we have the travel trailer leveling blocks. They’re some of the best leveling blocks around that work more than just to level our camper. These blocks are also a complete chock kit that we can always count on. There is nothing more convenient than that. And if we’re going to compare this kit with others on the market, you can realize that you don’t have to spend too much time to make your rig even. For that also comes with increased safety of our appliances like RV refrigerator and washing machine that can be ruined if they tilt or if our rig isn’t parked on a level ground. The leveling blocks are also flexible and that it can be used in travel trailers, campers, trucks, buses and other vehicles. You can also have peace of mind of ease of use because you can just drive on them until the wheels are level. When done, we can start enjoying the scenery and our outdoor adventures with loved ones. We don’t have to worry about our recreational vehicle wheels rolling or moving out of place. So in five minutes, we can go fishing roasting or doing the things that we love on the campsite. On a little negative, I’d appreciate if the maker could improve it to lift more than five inches for more versatility. When looking for levelers for the recreational vehicle, travel trailer, bus, trucks and trucks, among other vehicles, you might want to check out the Camco FasTen leveling blocks. It is a highly recommended product among other products in the same category. The 44515 comes with an interlocking design that makes it easy and fast to combine together and be stacked to your desired height. Another feature I would like to highlight is that I notice that it has the carrying handle system that allows for easy carrying and storage. When you have the 44515 yellow leveling blocks, you can customize the leveling based on desired height. 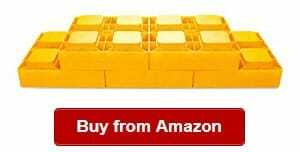 You will also have more for your spending because the leveling blocks come with 10 blocks already compared to others on the market that only come as a two-pack for example. I would also like to note that the Camco RV leveling blocks have durable and solid construction, which can ensure us of long lasting use. As someone that wants to get the most of my spending, I would like to use a durable RV leveling block like this Camco model is definitely a good choice. So if you would like to get the most of your spending, you might want to take a look at the leveling blocks. I noticed that the set also has good versatility that it can be used with other leveling blocks by the brand. And with that said, you won’t have to worry about having limited uses for this leveling system. The 44515 is also affordable, so buying a few sets won’t actually hurt and instead help us have a spare ready with us in case we forgot them on the campsite. 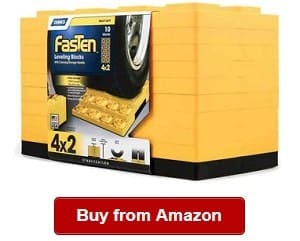 I would also like to recommend the Fasten Leveling blocks for people that have trailers with dual tires. The easy to combine and stack blocks are very easy to use for dual tires because they are wide, making it faster to roll over our dual tires without needing two sets of a leveling system. I also liked the carrying handle, which I believe are better in dependability than other blocks stored in a flimsy zippered bag that can break easily. The set is also UV-treated resin that makes it durable even on harsh weather conditions. On a drawback, you need to buy filler caps with the 44515. More so, it might not be as versatile as other leveling systems are. But overall, it is still one of my highest recommended blocks for leveling your recreational vehicle because it is durable, UV treated, easy to set up and comes in 10 blocks. When shopping around for good RV levelers, you should not miss the Beech Lane Camper Leveler. It is one of my favorite levelers on the market because it can perfectly level trailers, campers, airstreams, vans, trucks and campers without any hassles. One of the things I noticed is that the Beech Lane leveler is also very versatile to fit dual axle trailers with up to 32 inches in tire diameter. That’s an amazing value. And this one can also be cut up to four inches in order to fit, if necessary. This is a set that comes with two chocks, two levelers and two pieces of grip mats. With it, you don’t have to stress about leveling your RV when you find the perfect spot because it can offer you with free leveling in any increment up to four inches. So if you’re looking for a precise and ideal experience in leveling without the hassle of stacking wood or plastic blocks under the tires while not also guessing all the time, you can go for the Beech Lane Camper Leveler 2 Pack. This product can make leveling easy and fast. Every leveler is also about six inches wide and 15 inches long. It also includes two pieces of rubber grip mats that will prevent the slipping of the tires when you’re backing on. I also liked that the levelers are made with polymer construction that will last a lifetime. This is good news for me because I would like systems and accessories I am buying for my recreational vehicle to last longer. So when it comes to durability, we can be certain that we can depend on the levelers with high-performance polymer, which is normally used in load bearing applications. You should not also miss this set because it is backed by a lifetime warranty on their chocks and levelers. They also have a good customer support that you can easily ready to if you suffer from any issue using these levelers. On the downside, this set is a bit pricey and might break if used on rocky/sandy areas. 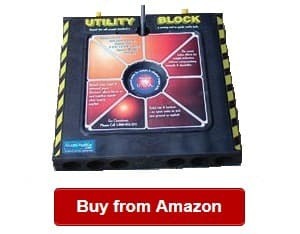 Are you looking for RV utility blocks? When it comes to levelers for the camper or recreational vehicle, one of the brands to trust is the Tri Lynx 00015. One of those things I noticed is that the levelers can be cut if you have to so that they can fit. However, you should be careful and ensure that you do it right to prevent any issues. But then, the system is standard with dimensions measuring 15 inches long, 6 inches wide and four inches high. If you’re looking for a system that is easy to use, I would also like to recommend this system because it is easy to set up in less than five minutes. The 10-pack option is a great choice for levelers because it has a modular design, allowing stacking to reach desired height without any hassles. I’d also like to take note that these Lynx levelers can withstand even tremendous weight, and that’s something to give us peace of mind. I had tried some products like this design before, and they failed me for breaking when I parked and used the set on a rocky area. You won’t have to worry about that with the set that is made of durable materials, ensuring the system will last long. In addition, I’d like to mention that the blocks are easy to configure in order to fit a leveling function easily and quickly in minutes. Using them, we don’t need to look for wood pieces or rocks to level our recreational vehicle when we got to the destination. Plus, it is hard to use those rocks or wood pieces because we have to keep guessing and to consume too much time in the process. More so, I liked that it can be used as a support base when we’re using stabilizing equipment. The Lynx Recreational Vehicle Leveling Kit is a decent choice if we’re also look for an affordable yet quality leveling system that won’t give us a difficult time to figure out how to level our RV. On a negative, the nylon bag included is flimsy. Another Camco camper leveling blocks not to miss in your selection is the 44505 leveling blocks, which are great for single and dual wheels, making them some of the most versatile around. Choosing the Camco durable blocks, RV owners like us can sleep well at night, knowing our RV won’t tilt even when parked. The 44505 is for single and dual wheels, tongue jacks, hydraulic jacks and tandem axles, making it one of the most versatile choices around for leveling blocks. In addition, I liked that the leveling system comes with 10 interlocking blocks, which can be used to achieve desired height for easy and safe leveling. More so, I noticed that the blocks are engineered and designed in order to optimize both the weight and strength of the product. Speaking of durability, the Camco Heavy Duty Leveling Blocks 44505 is also made of UV treated materials. What does that mean? It only means that they’re treated to last longer because they can handle weather changes and outdoor elements. If you choose the Camco 44505, you can have peace of mind that they will not be ruined even if left outside and exposed to sunlight for a long time. This one also has a unique design. Its bottom is solid that it can keep the levels from sinking into the ground. You will appreciate this product, too, if you’re going to use with other types of stabilization equipment. For easy transport and storage, you will also not have to worry because this system comes with a zippered storage bag with a handle. It will make it easy for you to bring it anywhere. Finally, I liked that the blocks are easy and safe to use. They can also be customized that you can rely on them for easy set up and leveling. However, the product is a bit pricey and can break if used on gravel. But overall, they are high quality and heavy-duty to last for many uses. 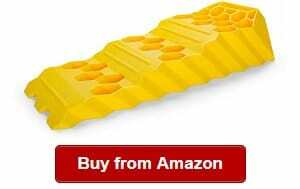 When looking for RV leveling pads, you should find products by a reputable brand. One of those that fit it is the Camp’N – RV Leveling Blocks, which come with integrated ramps along with a carrying strap. It has many great features that you will love and that will make you like it more. One of those I would like to note about this product is its heavy-duty construction. It is one of the features to look for when buying levelers. We should avoid those that will easily break or crush, or else, we might have to spend on another set again. These leveling pads are designed to handle even the heaviest trailers and campers. They are designed differently than other levelers on the market are. Each of them is made of a high-density plastic block, allowing dirt and water through it for increase durability. They’re unlike other leveling systems because they’re sturdier to provide better solution for us. These levelers are also better than other options on the market now because they’re using higher quality blocks of 1.5 inches versus others with only 8.5 inches levelers. It only means that these are thicker options that we can be certain of lasting longer versus products in the same category are. The RV leveling blocks are also going to stay in place, no matter what. The levelers also come with a carrying and storage strap, which makes the product better too when it comes to being easy to transport and storage. It is unlike others that I have seen that package their products in thin bags, which we know won’t last long. I liked that the manufacturer has ensured that its carrying strap is woven made even stronger by its sewn in handle and buckle that will keep the pieces together. The best part is that it is durable ad easy to get on and off, too. However, the Camp’N – RV Leveling Blocks might not be as durable as other sets on the market are, and setting up can take a while to get used to. But despite that, these RV leveling systems are dependable to ensure that we’re parking our trailer on a level ground to protect the appliances and gears inside from being damaged or tilted. 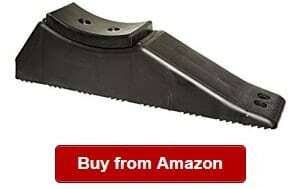 Are you searching for dependable RV leveling ramps? When searching for these products, you should find those that have the solid features that can make for durable leveling blocks. These chock blocks and ramps are also versatile and can be used in accommodating even heavy vehicles. 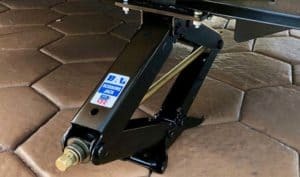 The travel trailer or camper levelers are some of the best options around not only for its versatility for use in many types of vehicles and motor homes but they can also keep your rig leveled especially when parked on an uneven surface. So if you found an ideal spot in the camping site, but then you discovered it is not even, you can just use these leveling blocks to make the parking spot even for your vehicle. Another thing I liked about the camper leveling system is that the BW4201 can really keep our RV level so that our appliances and tanks will not be damaged but operate efficiently. Another thing I noticed is that this BW4201 is a value bundle because the system comes with two pieces of leveling ramps, nylon carry bag and two pieces interlocking chocks. It is a real value for our money, so we should not really miss an offer as good as this one. You will also like that they have a good size to make them easier to use. Unlike other chocks con the market, these ones are designed to make our rig and travel trailers safe. The BUNKERWALL system is a tough product that can ensure that our RV will be leveled in minutes. In this case, we can immediately enjoy our time in the RV parks or camping site for more bonding times with our loved ones outdoors. Each ramp has an ideal and ample width of 7 and ½ inches, enabling it to lift wheels with up to 3.8 inches in diameter. It can also handle a max weight capacity per axle of 8,000 lbs. However, the included carry bag isn’t durable. Overall, I would like to note that the camper levelers are made of lightweight yet sturdy materials. While they are light enough, they won’t fail us when it comes to long-lasting use. These ramps are made with high-density polyethylene for carrying heavy load. This Camco tri leveler 44575 model is one of the best in the category because it is versatile to work on any tire. You can rely on the Camco Drive on Super tri leveler to ensure that you will park your RV on a level surface. One of the things that also make this choice a great leveler is that it can raise the tire for up to five inches a height higher than the others do that can only up to 4 inches. 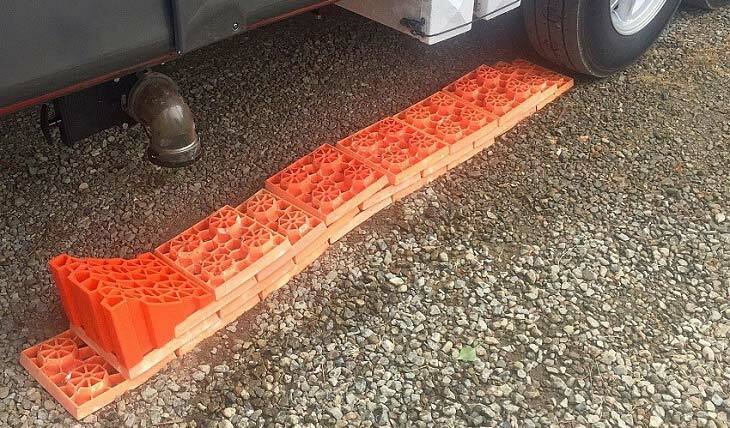 So if you would like to raise your rig especially when you’re parked in an uneven ground, you don’t have to worry about it because these leveling blocks can help. I also noticed that the leveling blocks have non-slip surface, ensuring they the levelers won’t be out of place. 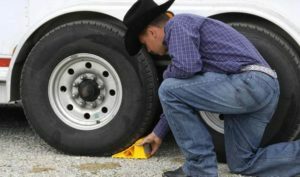 So if you want to keep your recreational vehicle safe and secure while parked, you should not think twice but check out the levelers that can work on any tire and offer it a leveler position. Another thing that I liked about the leveling blocks is that they are designed with a non-slip surface, which is also durable. The Camco’s RV Super tri-levelers are also durable and are designed to keep the RV in place and on a level position. They are also easy to position versus if we had to look for rocks and wood pieces, which will also just keep us guessing. On a negative, the weight capacity of the levelers is lower than others on the market can offer. If you’re shopping around for a reliable tire-changing ramp, you don’t have to search any further if you have the Trailer Aid. 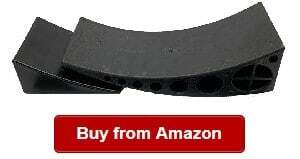 It is one of the best products on the market regarding changing a flat tire changing without any hassles. One of the things I appreciate about this product is that it is easy to use. You can change a tire with it without any outside help. That said you could rely on it whenever you don’t have anyone to ask help to if your tire is flat. Another thing I would like to take note is that this tire-changing ramp can help holding up to 15,000 inches of lift. This product offers a completely new quick way in changing a flat tire on a tandem wheeled trailer. Using it, you can lift a flat tire for up to 5 and ½ inches without any difficulty. Using the Trailer Aid Plus, you can have peace of mind that you can get assistance whenever you need it. In addition, this product is made with high quality components, ensuring you can use it for many years. More so, the trailer aid is also versatile that it can also be used in performing a routine maintenance on the rig for its included one-inch lift. Another thing I would like to note is that it comes with a lifetime guarantee, one of its unique features not on other ramps. On a downside, you might need a little getting used to in using the ramp. Shopping around for durable, quality and top performing trailer leveling blocks, you might be feeling overwhelmed. 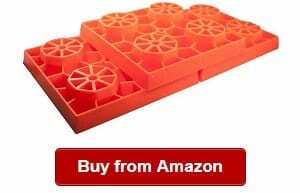 It is for the same reason you might want to take a look at the four-pack quality plastic utility blocks, which can aid if you want to ensure that your camper or rig is parked on an even ground. As you may know, not all campsites have even grounds especially the busy ones where travelers and RVers frequent to go camping or have an outdoor adventure with their loved ones. It will be a hassle if we have found that perfect spot on the camping site but then it has an uneven surface. Another thing I would like to mention is that the accessories also have many uses aside from keeping our RV or travel trailer on an even ground. After all, they are utility blocks and you can just imagine the many uses they have for you. Choosing these blocks, you can definitely save money because they are flexible to use for many other applications. In addition, the blocks have an ideal size for use in many types of vehicles. Also, these blocks also has a braided rope handle and keyed slot to accept a regular awning rod. In addition, I liked that the product is affordable, allowing us to buy a few sets of it so that we can have them ready all the time. After all, they are very useful for many purposes. I also think that we can also use them at home. However, this product is not as durable as other blocks on the market are. Overall, I liked the versatility of the utility blocks that we can use for many applications. If you’re trying to compare motorhome leveling blocks, you might want to take a second look at the AFA leveling ramps. They’re some of the finest products around in this category that I would like to recommend for its performance and durability. 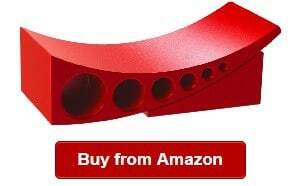 The interlocking wheel chocks are perfect for a camper, fifth wheel or recreational vehicle. The very first thing I noticed is that the wheel chocks and ramp are so helpful when it comes offering a secure fit. With them, we can have peace of mind that our camper or RV will stay in place even if we parked it on an uneven ground when we reached the camping site. You can also worry not even if we are parked in a place where there is a harsh condition. The interlocking design can ensure a secure fit for peace of mind that the camper or RV will stay in place. Another thing I’d like to mention is that it is a complete kit that comes with interlocking wheel chocks, maintaining max stability and preventing rolling on any uneven surface. More so, you will appreciate that it comes with a carry case, which makes it easy to store and transport. In addition, the leveling system comes with raised grip ramps made with high-density polyethylene that makes the product more durable than others made with different kind of materials are. The AFA Tooling Ramps weigh only 3.3 kg per pair, ensuring you can easily transport and store it. However, it has a limited compatibility. 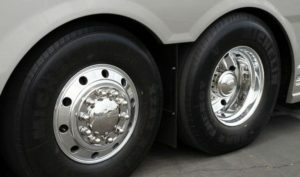 It should not be used with vans having 13 inches wheels and with minimum distance between tires treads under 19.68 inches. Overall, it is one of the best choices on the market that you might want to take a second look into if you’re looking for a high performing and quality product. Are you shopping around for a high tech leveling system versus ordinary rubber leveling blocks are? Take a second look at the LevelMatePRO. The levelers are high tech that they make use of a wireless system to operate. So being innovative, you can expect for some computerized or digital features. For one, it can report on how much exactly is the height we need so that we can achieve a level position. That is not all though because it can also tell us where we need that height on what side. It works straightforward enough for us to use it easily. This system is making use of a Bluetooth 4.0 in order to connect with our tablet or Smartphone. Such connectivity feature also translates to convenience of use. There is nothing like this system that I have found to be as reliable as it is. Adding to that convenience, we can also rely on its easy to use app that can show needed information without us having to guess. Another feature I liked about the LevelMatePRO is that it can be used for towable and drivable vehicles. It works smartly that it can tell us the leveling data needed as we are pulling into an RV site, letting us know of the ideal spot before parking. 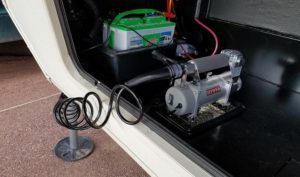 And if we’re going to use it for towable vehicles, it will let us save and remember our hitch position that allows for reconnecting to our tow vehicle easy and quickly. However, the leveling system is expensive. But overall, the wireless leveling system is one of the most reliable around if you’re looking for precision and convenience. 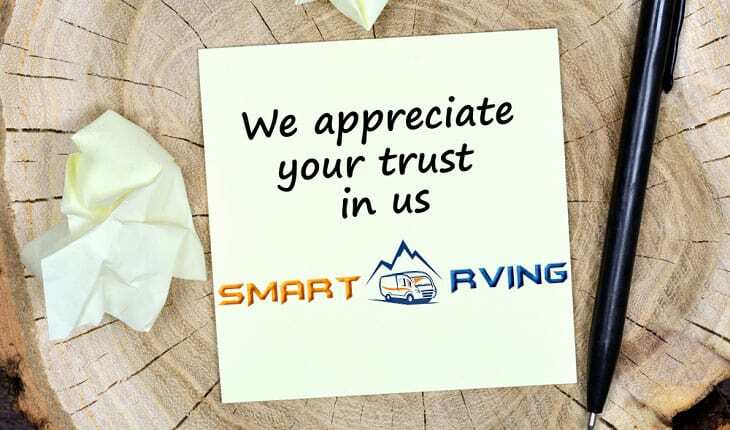 You should trust Smart RVing because we have the same goal – to get the most of RVing with help from the most reliable appliances, accessories, gears and systems for a recreational vehicle. Just like you, we’re consumers/RVers always on the lookout for the best products to use for our rig so that we can get the most of camping and outdoor living. For this reason, we carefully selected the products to review and include on our list. We choose only top-rated, quality and durable RV leveling blocks or levelers so that you can pick the best of them to last for years as well. Before we reviewed the best products for leveling systems, we thought about the most crucial factors to look into so that we can dig into each product well. From those factors, we’ve chosen the top products on our list, reviewed each and highlighted the pros and cons to ensure you can carefully think about and compare your options. Bottom line, you should trust us because we have a systematic process to conduct the reviews done by a seasoned RVer who has firsthand experience using such product. Hopefully, you can pick the right RV leveling block or system after reading today’s guide. 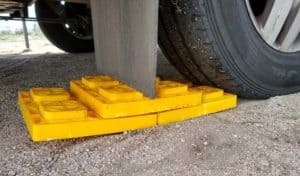 An RV leveling block or a leveler, such as Lynx leveling blocks, are levelers we use in adjusting our RV’s height in order to level to an uneven parking ground. They are used to protect our RV interior especially its contents like appliances and furniture. Sensitive electronics such as refrigerators and washing machines should not tilt or else they might be damaged. The levelers, thus, can ensure that our rig is aligned to ensure that our appliances will work at their optimal function; they won’t slide or slip when we’re inside and parked. For example, a recreational vehicle refrigerator will not work if it is tilted. It might also be damaged if slanted, or else it might cease to work. Even if we can use a jack to adjust one side of your rig, it cannot be relied on to do the job of leveling blocks. They are not designed and made to support our mobile home, travel trailer or camper. Otherwise, it might cause an accident because it might break and damage the RV frame eventually. How do recreational vehicle leveling blocks work? 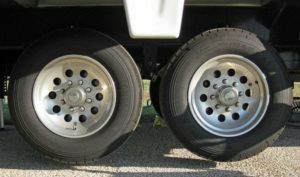 Plastic, interlocking or inflatable RV levelers work by adjusting the height to the wheels when on the ground. What we usually do is to drive over these blocks to get an even level. The blocks can be stacked so that you can get your desired height. You can lift your rig with them at least four inches in most models. There are other types that can also be used as ramps, allowing an easier driving up on to level our RV. Before picking dual wheel leveling blocks or ramps, for that matter, you should be aware of the types of these products available. It is to find the right one for you and your recreational vehicle. One of the types of leveling blocks is ramp-leveling blocks. They do not require stacking unlike other types of levelers do. Their unique features include being molded like stairs. Each of these stairs have a fixed height. But there is one problem, though. 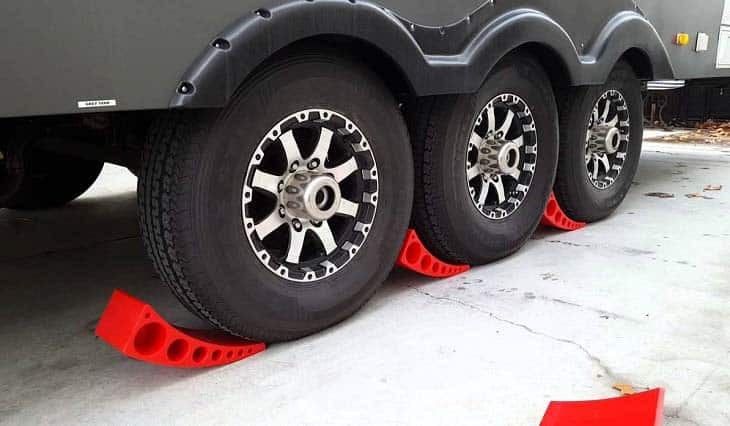 These levelers tends to slide or slip when driven on, so some of them also come with rubber grip mats placed under them so that they can prevent slipping or sliding once the RV is leveled. On the other hand, there are also interlocking blocks, which are made of square plastic tiles. Unlike the other type, this one need stacking up like a stair, so they usually come in 10 or 12 per pack. Choosing this type, you will also be able to adjust the height of your RV so that it levels to the ground. Usually, a block stands from one to two in inches. Stacking against each other, you’ll be able to increase the height up to one inch until your RV is leveled on an uneven ground in the camping site. Then, there are now new technologies also being introduced in this category, electric levelers and inflatable levelers. 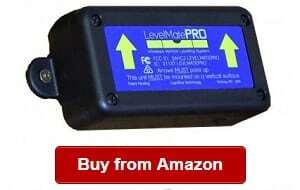 The electric levelers are those for the RV owners who do not mind spending a bit more on leveling blocks. They opt for leveling jacks, which work intuitively in order to level the vehicle. You can find complete leveling systems that have four legs installed in the vehicle. The minimum amount of it will cost a whopping four-figure dollar. But then, do take note to add the cost of the installation, too. Finally, there is the inflatable leveler that is another innovative product introduced in the category. They appear as flat bags, which are placed under the recreational vehicle wheel that needs leveling. What you need to inflate these bags is an inflator pump used in pumping until they reached your desired height. While it is an easy process to do it, many owners don’t like these types because they feel that the bags make the RV unstable. You need leveling blocks to ensure that your RV will not shift to one side and cause an accident or a problem. For example, you will find it problematic for your RV to move or shift to a side especially if you’re parked and doing something inside, like cooking. You can just imagine the trouble or accident that might take place without a leveling system, which proves more useful when parked on an uneven ground. Using these leveling blocks, we can stabilize our recreational vehicles and keep it leveled to prevent moving or shifting to one side. Also, the leveling blocks can prevent the damage of sensitive electronics like refrigerators that should not be tilted or it won’t work. With a leveling system, you can have peace of mind that your appliances will be protected from damage due to an uneven ground. The next question you may have in mind about these leveling blocks is what features to look for when comparing your options. So if you want to get the right leveling blocks to give you the most benefits of using them like preventing your appliances from being tilted or slanted and keeping your rig leveled on the ground to make it stable even when parked in an uneven surface, you should check out the following for the things to consider. Just like buying anything for the recreational vehicle like the best RV wheel chocks, you should also pick one made of heavy-duty materials and UV-treated in order to ensure that they will be long-lasting to offer you with years of service. Then, you should also pick those that won’t split or crack easily when used. Or else, your rig will shift to one side that can trouble you especially if you’re inside and doing something. You can prevent it from happening by choosing an RV leveler that will stay tough even when used frequently and prevent cracking or damage. Also, it will be dangerous when the blocks break suddenly. For one, it can cause someone’s injury or your RV frame’s damage. More so, the leveling blocks should be tough enough to deal with the changing temperatures especially if you go camping in places where there are really hot or cold days/nights. How convenient or easy are they to use? Whether you’re going for RV leveling pads, ramps o interlocking blocks, you must compare and find out how easy that will be to use them. 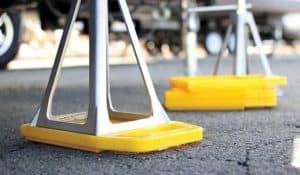 The RV levelers should be easy to set up even if you’re alone. Additionally, you must check that the blocks are easy to transport, clean and store. For transport, some of them come with a carry handle or bag. You can also check on it when comparing your options. Overall, you should not pick levelers that will give you a headache in setting up. You must ensure that it is convenient to use and quick to install. What max weight can it accommodate? Remember that not all leveling blocks are equal in terms of weight they can support. So when comparing your options, you should be able to ensure that the leveler can handle the weight of your vehicle. For example, there are models that can handle heavy recreational vehicles with a total weight of up to 40,000 pounds. In all cases, do not go for levelers that cannot accommodate or hold the weight of your travel trailer especially when all the stuff is inside it. Do not end up buying levelers that cannot accommodate the load for which you plan to use them. The longer the warranty could be better. It is another thing to look for in terms of the features that can make a leveling block good. Manufacturers who are more confident of their offers can add a better warranty on their products. Just like when shopping around for the best RV GPS, you should compare your options based on the price of the products on your list. However, do not go for one just because it is the cheapest. Remember, you must be able to strike a balance between quality and price. Compare your options based on the quality of the levelers and their price. Also, you should take note that some of these products are more expensive because it is a top brand, while others are because they’re electric. Q: When are leveling blocks required? A: You need levelers, such as Anderson leveling blocks, for your vehicle because they can keep it stable and not shifting to one side. They’re needed especially when the parking space or ground on the site is not leveled. 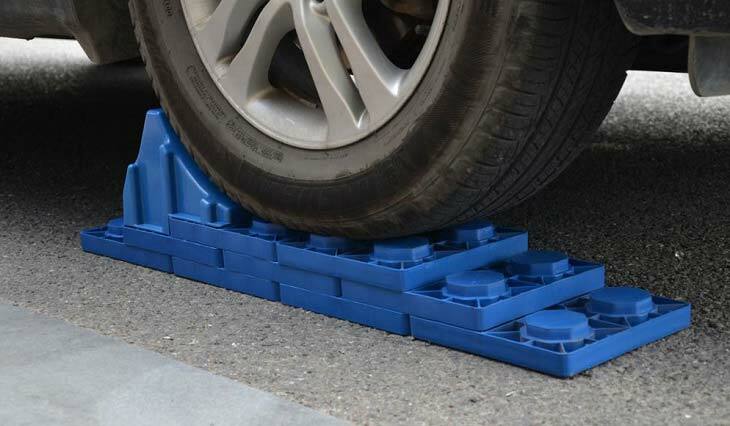 Campers also require these blocks because they can help you adjust and achieve the desired height of your vehicle. Q: What are good RV leveling block brands? A: If you’re trying to compare and figuring out the best brands for levelers, you can take a look at some of the brands, including Andersen, Camco, Beech Lane, Lynx, Camp’N, BUNKERWALL, Trailer-Aid, AFA Tooling, Quality Plastics and LevelMatePRO. Q: What are RV leveling blocks made of? A: Most of them are made of tough and durable plastic materials. 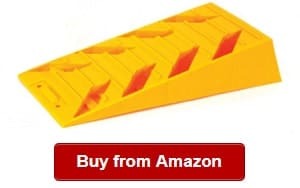 Some of those we’ve featured here are made with top quality and high-density polyethylene, which is one of the heaviest duty material around used for RV leveling blocks. Q: How long does the chock last? A: There is no definite answer here because some of them can break, crack or crush easily if you used a lower weight capacity leveler for a very heavy camper or trailer. For this reason, you should not misuse the leveler. When choosing one, you should compare based on the weight of your trailer to ensure that what you’d choose won’t break easily. Q: How many leveling blocks do I need? Q: How high can you build them? A: It depends on the leveling system you have chosen. There are some products that can only be used to raise the vehicle for up to four inches; some may be higher. Q: How to use RV leveling blocks? A: How do you use the best RV levelers? All you need to do is to lay the blocks on where you are going to park your RV, and then stack them based on the desired height that would level the recreational vehicle. But if you’re using ramps, all you need is to drive on top of them and that’s it. Q: How to level a motorhome or travel trailer? A: You can do it easily! If you’re using blocks, you just have to stack them until you reach desired level for your camper or mobile home. But if you went for a ramp, you just have to drive on top of it and you’re good. A: If you don’t want to hassle yourself on how to make your own leveling blocks for camper, you should just buy them. While they can also be available in local RV supplies store, more varieties of them can be bought online, such as on Amazon and eBay. Nevertheless, you might as well buy on the web for a wider selection and better price. While you might find it challenging to select the best RV leveling blocks, you will find it easier by checking out the things to look for when trying to compare your options. We do hope you can use our shopping guide and top picks in making a decision and buying your preferred leveling system for your camper, recreational vehicle or travel trailer today!